Going in, Matthias was hoisted up by the wood. On the ninth divine Matthias was hoisted on the wood. The Holy Apostle Matthias was a descendant of the tribe of Judah and born in Bethlehem. In his youth he studied the law of God under the guidance of Saint Symeon the God-receiver (Feb. 3), who instructed him in the life of virtue. After thirty years, when our Lord gathered His disciples and began preaching the kingdom of God with power, signs and miracles, Matthias also followed the Lord and was chosen to be among the Seventy Apostles (cf. Lk. 10:1). Following the Passion, Crucifixion, Resurrection and Ascension of the Lord, the Eleven Disciples of the Lord were in a position to replenish their number of Twelve following the betrayal and suicide of Judas Iscariot. For this reason they chose two men who had followed the Lord from early on in His ministry, Joseph and Matthias, and after casting lots under the guidance of the Holy Spirit, the lot fell upon Matthias to take the place of Judas. Matthias thus fulfilled the work of apostleship and the prophecy concerning Judas, which the Holy Spirit foretold by the mouth of David: "And his bishopric let another take" (Ps. 108:7). His apostleship was confirmed on the day of Pentecost, when the Holy Spirit also rested upon him as the other eleven Apostles. Not long after, the Apostles cast lots to see where the Lord appointed for them to go and preach the gospel. For Matthias the lot fell upon Judea, where he went to each village proclaiming the good news of our Lord Jesus Christ to both the Jews and the Gentiles. 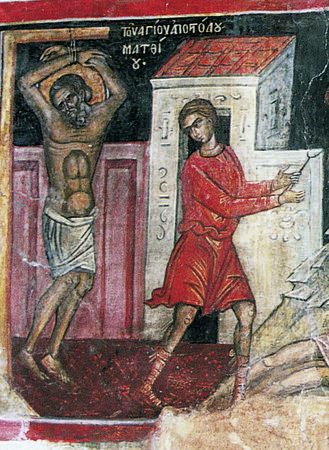 From there, tradition tells us that Matthias also went to Ethiopia, where he endured many and diverse afflictions, including being dragged on the ground, beaten, suspended from a pillar, lacerated in the stomach with an iron blade, and burned with fire. All these torments Matthias bore manfully and with joy, and according to some it was there he was martyred. 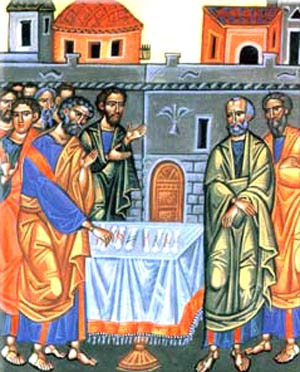 Tradition also tells us that Matthias went to Macedonia, where he was forced to drink poison that had the effect of depriving men of their sight. However, when he drank the poison in the name of the Lord, he was unharmed by it, and even healed two hundred and fifty men that had been blinded by the same poison, by laying his hands on them and invoking the name of Christ. After this he was arrested, blinded and imprisoned for turning people away from paganism. In prison the Lord appeared to him in a great light, and healed Matthias and freed him from prison, going on to baptize many in that region. Matthias then returned to Judea, where he proclaimed the gospel and worked many signs and wonders. When he was going about Galilee, Annas the High Priest had Matthias seized and summoned before the Sanhedrin. There Matthias was forced to give an answer for leading the Jews to follow the teachings of Christ. He therefore gave an extensive explanation of the Old Testament books which speak of Christ, and boldly confessed that Jesus of Nazareth, whom they delivered to be crucified, was the Son of God. This confession drove Annas into a rage, and ordered Matthias to be stoned to death. When they arrived at a place called Bethlaskila, two witnesses placed their hands on his head, as the law demanded, testifying that he had blasphemed God, the law and Moses, and they were the first to cast stones. After Matthias delivered his soul into the hands of God, the Jews had him beheaded to please the Romans. Then the faithful took his relics and buried him with honors. Portions of his holy relics can be venerated in the Roman Catholic Basilica of Santa Maria Magiorre in Rome and the Monastery of Kykkos in Cyprus. In Georgia it is believed there is confusion as to whether Matthias went to Ethiopia or Georgia, therefore it is believed there that Matthias was martyred in Georgia and is buried there. The divine Spirit chose thee to fill the twelve-numbered rank of the apostles, O glorious one. 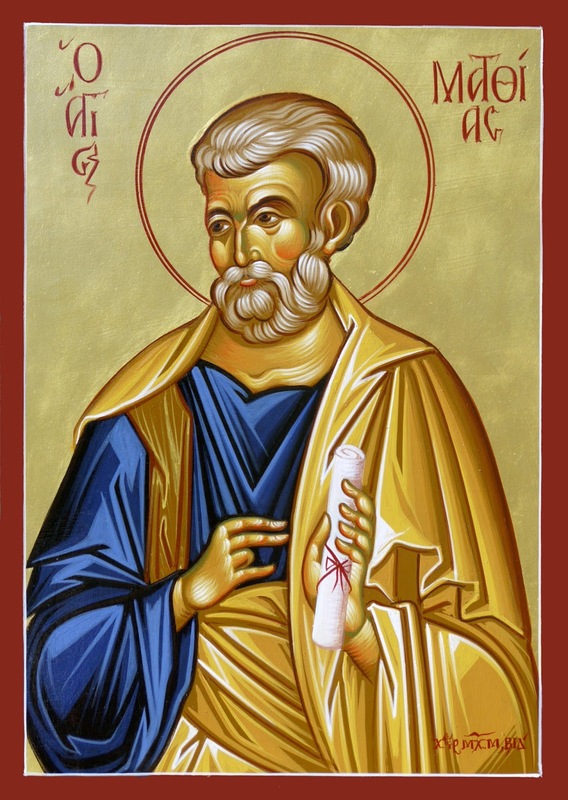 And with them thou didst proclaim the kenosis of the Word, and was made wondrous, O Apostle Matthias. Therefore, intercede for them that honor thee, that they be granted forgiveness of sins and great mercy. 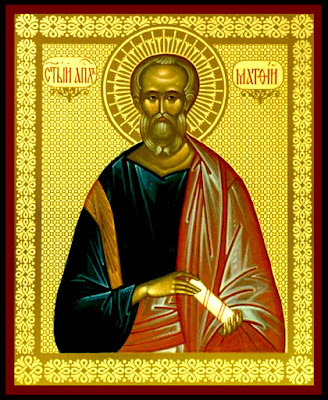 Like the rays of the sun hast thy word gone forth unto all the world, and it enlighteneth with grace the Church of the nations, O wondrous Apostle Matthias. Thou wast called to compliment the blessed choir of the Lord's disciples, O Matthias, mighty in grace. Wherefore, we proclaim thy great labors in preaching Christ God's dispensation for all the sons of men.